I don’t use anything on my skin anymore and rinse with water a few times a week, but even that is a little drying. Hi Nathan – wait so why are you changing the kind you use? That looks like a good quality – is it because it made your skin yellow? I think so, but I’m pretty sure it was the honey and not the jojoba… You are correct – it is a very good oil! Hey I’m also experiencing the Same thing(13 yrs old) and I have been trying to find out why and how to stop this. Maybe your over cleansing which can lead more sebum production which gets stuck under the skin to form clogged pores (tinybumps) and if you squeeze it out there may be a clog pore come out. Before you do this make sure your hands are cleaned and ur face then open the pores of ur skin by putting warm water or steam then start gently proding the skin to make the bumps go an then wash your face and put cold water to close your pores and make sure to cleanse and that may help. I’m gonna try the jojoba oil thing and if you would like I will get back to in like 2 months so I have more accurate results and if anyone else has more info please also help me I don’t wanna end 8th grade like this! Hello there! My 15 yo daughter and I have found that sensitive skin’s version of acne sounds like the clogging/small bumps you are getting. Sometimes, there can also be a bacterial factor, especially if you’ve ever squeezed (I can’t help myself, but I am getting better), as this brings more bacteria up and that bacteria can cause problems all the way to the basement layer of the skin. Have you found something that has helped? Do you wear makeup? I washed tonight with a raw honey that has the honeycomb/beeswax blended in, so it gives a nice but gentle exfoliating action. It INSTANTLY started to unclog pores that drive me crazy! Then I put coconut oil on to take advantage and my skin is so clean! *side effect of honey is also dryness, tingling/burning and itching. This is due to the pH of our skin being off. Yeah, my skin isn’t sensitive thats the issue, but i would love to try washing my face with honey! I do sometimes wear makeup but I ALWAYS wash it off though! I have recently started steaming my face and it seems to be working pretty good. I don’t use oil as I found out that it does clog my pores. Though my skin has gotten better. I also can’t help but squeezing the sebum out too!! I know it gross but its so therapeutic to me, lol. Oil cleansing will provide proper hydration and lift everything up and out of the pores that you cannot see. Once the skin is appropriately hydrated it can begin to release past trappings and renew skin cells. I actually experienced the opposite with jojoba oil. I tried it several times cold and unpressed and it clogged so many of my pores. I took accutane a few years ago for a month and I hardly had clogged pores before, but after i took it, my face was clogged… so maybe my pores changed? but I could say that jojoba is useful for a lot of people, but doesn’t work for everyone. unfortunately, I need more abrasive exfoliants. I am not brave enough yet to try this. haha. but i give you mad props Tracy. ps your hair looks cute! I would actually say Evening Primrose Oil or Blackcurrant seed oil or Borage oil were closest to skin composition because they’re made of linoleic acid. Unfortunately my experience with jojoba was like Sarah’s(minus the accutane) in that it did not help with congestion… and actually made it worse by causing clogged pores in areas of my face that had previously been clear. I used the same brand as Tracy which is very high quality(I found the texture seems to be finer/lighter than others). Like with everything else, trying jojoba is trial and error and I guess you will either love it or leave it. This is true! Sorry to hear it didn’t work out for you Tina! So I’m going to be trying the jojoba oil out. I think that if you take it just by itself without working out or eating right, it wont do much for you. So I am going to exercise everyday, and eat lots of healthy foods, along with leafy greens. I really want my skin to be clear. Committing full on is the best option for me. I was on amazon anyway so thought id lok around. Herbal choice mari jojoba oil looks like its pure. Have u seen this one? I can order one of the brands you mentioned, but i am curious about your opinion on this one. Hi Lana – looks like a good choice, as far as I can tell! I just want to say that I absolutely totally LOVE jojoba oil as a moisturizer. I have very oily, congestion and clog prone skin and jojoba is hands down the best moisturizer I’ve ever used. I’ve tried SO so many different kinds natural and unnatural, and nothing compares to jojoba. It doesn’t sit on my skin, it doesn’t clog my pores, it doesn’t make me feel greasy. It gives me just the right amount of moisture, my skin actually feels balanced and normal when I use it. Are people who are having problems using too much? I put mine in a little amber colored bottle with a dropper, 4-6 drops is enough for my entire face, no more. I use Aura Cacia organic jojoba. Sometimes I mix it with my own blend of essential oils: Lavendar, tea tree, euclyptus, geranium, and helichyrsm. It smells awesome and had major zit banishing power. Hi C – Great to hear you love it too 🙂 I think in some cases when it doesn’t work for people, they are using too much. But it’s hard to really say what the problem is exactly! Congrats to you for being brave enough to try this! Not too long ago, i read a lot of raving reveiw on acne.org about coconut oil and how so many ppl had good results, so of course i tried it! It always just felt lk the oil never mixed in and just sat on my skin! It beoke me out very badly after about a week of tryg it! :( idk maybe i didnt do it right?! What about the ocm? Have you ever tried that? I did it for lk 3nights, and my skin felt great.. I only used grapeseed oil to do it with tho..but then i freaked out, because i read about a lot of ppl who it was great for 3 weeks and then the broke out lk crazy!! .. Just wondering your thoughts on it? Thanks and glad the jojobe is working for you! I have used the OCM before when I was first transitioning from commercial face wash to the caveman regime. Before starting the OCM I had an EXTREMELY oily t-zone and sahara like cheeks/chin and the idea of adding more oil to my already oily t-zone freaked me out. I was also pretty flakey on my nose and in between my eyebrows-weird for an oily t-zone, I know. When I tried the jojoba oil on my skin I immediately began to breakout within the first week. (During the experimentation I was using ONLY grapeseed oil or ONLY jojoba oil, not both, to judge how my skin reacted). I learned it was the jojoba oil that my face didn’t like. In the time it took me to find an oil that works with my skin, my OCM regime had really slacked A LOT. I was doing it twice a week, tops. And even though my skin wasn’t compatable with either the jojoba or grapeseed oil I DID notice my t-zone had stopped over producing oil. Hang in there and don’t be afraid to experiment! What brand and type of coconut oil have you been using? From what i understand from reading, out all of the oils you tried, coconut oil works the best for you!? How much do you apply like one fingertip? And are you also doing the caveman with this? I have only been splashing with warm and cold water once at night and i notice a huge difference, but i do also have a few clogged pores on forehead, so i was thinking maybe the oil wld help break it up! Guess im still scared after coconut oil experience, but im thinkg maybe i wld put to much on and i wld leave it on all day!! And it was also summertime!! The amount I use varies depending on my purpose. For instance, if I seem to need a bit of moisturizing then I’ll put a very thin layer on my finger (imagine you are putting the oil on your lips- you wouldn’t scoop a glob out for that) and apply it directly to my face as much as I need. If you’re using it this way, you should NEVER look oily after you apply it. However if I am using it to “wash” my face (I have a more lax caveman regime than Tracy) then I use my first three fingers (only one hand) to scoop out enough to massage into my face and hop into the shower. You know how the OCM uses a washcloth to wipe the face? I’ve found this is really harsh on me so I massage my face in tiny vigorous circles for a few minutes. Most of the time I don’t need to apply extra oil after getting out of the shower. Don’t be afraid to experiment with oils! I know you had a bad experience with coconut oil but don’t let it scare you off from trying the other oils. You’ve already figured out that your skin doesn’t like coconut oil so cross that off the list (in my experience I’ve found that if my skin doesn’t like something, no matter what the circumstances or how they’re tweaked, my skin just does NOT like it). Try the grapeseed oil or the jojoba oil like Tracy. I’ve heard that some people use almond oil, rosehip oil, and tea tree oil (to name a few). A few months back, a girl named Svea did a guest post on oils (I can’t remember the title, I’m sorry) and she is very knowledgable in that area. She also has a blog with a post about oils. (www.blackoldchewinggum.com). It’s very informative without the hours of googling. You know Kim, I do the ocm with olive oil and castor oil- mostly olive and a little castor, never really measured. Guess what? It works, that’s what! When I first started it wasn’t so cool, and then a week later my face broke out worse, but I discovered my problem and fixed it. It was the washcloth! The stupid washcloth I was cleaning my face with was clogging my face with little cloth particles. And so now I just use my hands. And some days I do the oil cleaning, just without the oil. Like maybe twice a week, when I’m lazy. And for the first time in my life, my cheeks aren’t all red and splotchy! And the bumpys are waaaay less! Oh and my face was originally oily. And olive oil is good for hair too. After showering while it’s still wet, I rub a little bit olive oil on the palms of my hands, just enough to make them siny, and smooth it through my hair. It gives my dishwater blonde hair a cute golden shine! I love it! I’ve been using rose hip oil to cleanse my face in the evenings and it’s been lovely – leaves my skin feeling so smoothe! I have an extremely oily nose and cheeks, my cheeks mostly just open pores but my nose is constantly clogged up – I’m absolutely going to try this jojoba trick, using the smallest of amounts. It seems like my skin will respond, or at least I hope it will, because of its very oily nature! I’ll keep you posted! Once again thank you for your continued reports :). 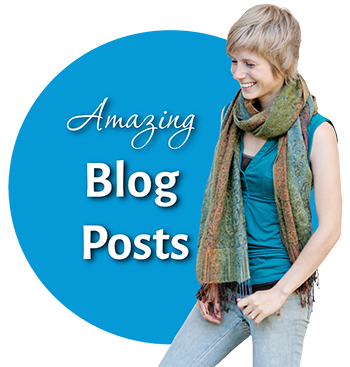 When you posted an article about manuka honey and jojoba cleanser you made, it totally worked for me. I too have the hormonal stuff on the chin. Diet has kept that area almost clear, but when I have flair ups, I just use the honey straight and wear it as long as I can to overnight by applying as early as possible to soak in, then try to rub it in right before I go to sleep. As for the jojoba oil I use it all over, and love love love it after I shave my legs, underarms and bikini area. I too use a tiny bit of coconut oil as a daily moisturizer since it naturally has spf in it and doesn’t get “greasy”. Once again thank you for all that you do, try and share! I was wondering about the honey and jojoba oil method you used to use, at the moment I’m using extra virgin olive oil to remove make up and Liz Earle products to cleanse tone and moisturise but I would like to go even more natural. Would it be safe to use honey on the skin if i’m on a strict anti candidas diet for intestinal candidas which i’m not allowed eat honey? I’ve tried researching this and can’t find an answer. I do know there are soo many different variations on the candidas diet anyway! Hi Carolina – the honey is fine to use on the skin during a candida cleanse – as far as I know, honey molecules are too big to by absorbed into the bloodstream via the skin. Thanks Tracy! Will give it a go so! I’ve been following the caveman regimen for about a month and a half now. Initially it was awesome, and my face drastically improved. Then i had a TON of breaking out all over my chin and forehead about 2 weeks ago. So I freaked out about it, and wanted to stop the regimen, until i realised that i’d been eating awful food, not sleeping enough, and also had been using a flanel and warm water on my face every couple of days (somehow that snook in there without me really noticing that i shouldn’t be washing my face). And so I’ve changed my diet a lot, cut back on dairy, bought some lovely fresh veg and started drinking bottled water (may have to buy a filter if i want to keep that one going on a budget). Anyway, apart from the infamous flakes, my face is looking much much better. However, I have a huge crop of clogged pored on my cheeks and forehead. I’ve had them for such a long time that I guess i’m just prone to clogging. But i’m soo glad i found this page and i’m very excited to give it a try! I’ll let you know if it works for me! Which should be interesting because even though my skin isn’t so bad for spots and inflamed acne, it’s probably some of the worst skin I know for blackheads. It’s been bothering me for YEARS now. So we’ll see! Wow. I have been dealing with tons of clogged pores ever since giving up my acne prescription a few months ago. Lately I’ve developed a lot of white bumps on my chin. I tried the jojoba oil last night, just rubbing in one drop on my chin before bed, and this morning all of those bumps are literally gone! I still have quite a few blocked pores, so I’m definitely going to keep with this and see if it helps. Thanks for the tip! Ok at the risk of sounding silly – what do you mean by skin congestion? Do you mean like blackheads? I ask because I ordered my jojoba oil and I’m still not sure if I should do a modified caveman and add jojoba or try washing with jojoba oil and patting dry with towel. I have a question and wasn’t sure where to post it. I was just wondering if you’ve tried Manuka Oil? I’ve been reading that it’s even more effective than Manuka honey, but I don’t want to waste my money on it. Hi, I’ve been a fan for a while without u Knowing it. I did the caveman for a month With a washing of warm water every four Days. My skin was looking better. My nose was dry and peeling but I didn’t Care because I didn’t have Pimples. I only started having after I turned 20 and began to do some homemade Facials and broke out on my cheeks. I have had on going acne there and now I am pregnant and the joy:) but it was Really looking better after using Nothing. So I heard of using mederma for Acne scars and I did and I am not sure if That contributed to my three new pimples! My question is should I continue with The caveman or be more Aggressive because its been a month and My acne came back ( I did consume a lot Of sugar recentl). My next question is Jojoba oil- sounds good. My nose and chin look Clogged and my nose is getting more black Heads. What should I do with the Jojoba oil for my nose? Thank you! I hope That by not washing I am not ruining my Skin. I wash my hands after the bathroom So is this better? Thanks for your time! Well, it sounds to me like the caveman was working and when you did the facial and added these other things in, it disturbed the healing. It sounds like it’s pretty common when people disturb the process too soon that it results in some pimples – go at least 30 days or more if you can before you do anything. And even then I would only suggest lightly exfoliating with some muslin cloth or just your fingers, not doing a mask. It’s also common in the first while on the caveman that the skin can get more congested and have more whiteheads/blackheads etc, which usually will sort themselves out, and if they don’t then you can start adding a bit of jojoba oil into it the mix. I wrote that late last night so It was a bit choppy. Thanks for taking the time to answer back I really think its generous of you. Pretty much my acne started when I was 20 and I used a bunch of products (not accutane or proactive).. Few years later- now- I have stopped using products and started with the caveman routine for a month. My skin was looking less inflamed from not washing it. It felt more soft and elastic. I was finally clearing up! Hooray! I was so overjoyed I bought mederma for my scars and I got three pimples right under where I put the cream. I think it could’ve been from that or the sweets And dairy I’ve been consuming , or a combo. So I’m leaving it be, no makeup, no face wash, no Mederma, nothing. The breakouts were on my cheeks and chin( the only place I break out) and I want to put jojoba oil on my congested nose where I don’t break out at all. It looks like I am getting more beauty marks and I think it’s blackheads! Could I start with the jojoba on my blackhead nose which is oily? i wont touch my cheeks with water or jojoba. i just don’t want a gross nose! Also I think my pimples get worse on my cheeks because I have some side burns that really kill me, I have dark hair and so instead of waxing or tweeze- ing I’ve been trimming with my scissor. Did that irritate it? Should I clean my scissor more? I can’t have the sideburns! What could i do that wont irritate my skin?Thanks for all Ur help! Okay, in that case, I would say yes, use the jojoba just on your nose! And sorry, I don’t know what to suggest about the sideburns! The scissors sound like a less irritating option than the other things. I just received my jojoba oil from Mountain Rose Herbs (that you recommended in another article) and I am hopeful, yet anxious to see how it goes. Anxious because of the “purging period”; but I’ve got nothing to lose. I am taking your advice to heart by using a tiny amount of the oil on my acne-prone areas. Thank you so much for doing what you do! Whenever I feel the need to pick or pop my pimples, I make a bee-line for my laptop and read and/or watch one of your articles/videos. You have helped me immensely and I am so grateful. I have also improved my eating habits by adding whole, anti-inflammatory foods into my everyday diet. 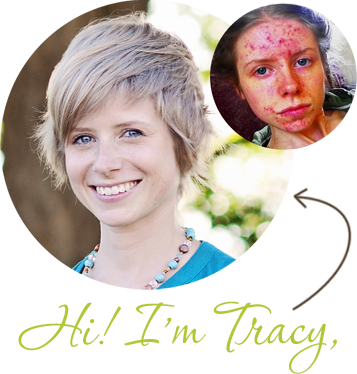 Your site has been the most helpful and informative tool that I have found on the internet regarding acne. You are a gem! Sending you a cyber-hug from San Francisco, CA! I also forgot to mention that I got off birth control during the summer as well. Soooo I’m starting to think it’s more of a hormonal imbalance than anything. I think I might go to a naturopath. What supplements do you recommend for someone my age? Hey Tracy, your skin looks lovely 🙂 I’m only 20 my skin was the same until I used a stupid exfoliator which contained sunflower oil! Don’t ask why, I know it was stupid and I wish I can just turn time back. Too bad i can’t, my skin used to be so smooth and clear. Now my forehead has small bumps all over it and is rough, I also have minor breakouts and the rest of my face is slightly rough, not as much as my forehead. I was wondering if you recommend this oil which you are talking about? Also any tablets or anything else? Ok since last night I have not washed my face atall or anything. Although I purchased some jojoba oil today and used a small amount on my face (forehead). Sanny Hey Tracy.. I’m doing the caveman and am using the oil for my clogged pores.. It is going through a purging period. Do you still use it after the pores are unclogged? How long might this take? Also, I’m really waiting for your next email to me. For the free book. It’s been a few days. I havent heard back from you on your thoughts on honey possibly turning skin yellow? i dont wash with it all that often because of this concern. I was also curious if you have ever used yogurt as either a mask or wash. i love that as well. and finally, what is your suggestion for the best diy way to remove blackheads?? id love to find a good way to do this without harsh facials. a method besides caveman, as that is just not something id do. Well, I have never encountered this problem with my own skin, but sounds like other people have. It might be the type of honey or something. Before you’ve found jojoba oil, did you squeezing blackheads? Some people do that, but can infect your skin getting it inflamed. and propably you do not recommend 🙂 I try find natural remedies for clogged pores. You are super beautiful and have amazing skin! I’m interested in the caveman regimen, but I swim 22 hours a week, and have bad acne. Help! I understand – I’m not sure what to say about it. I don’t think massive amounts of chlorine jives too well with the caveman so if your lifestyle doesn’t work with it and can’t be changed, then you can’t try it. If swimming gives you joy, I don’t want you to quit!! Hi tracy! thank you so much for this post.. I want to clarify/understand what clogged pores are exactly..
basically.. the middle of my chin and in the middle of my eye brows and around my forehead.. I have these little bumps that are like under the skin flesh colored/redish.. its not acne but its so ugly.. specially if u were make up its all these tiny dots.. Is that what clogged pores are? Do you have any other advice/ways to make them go away? I’m not sure if what I have is what your article is for.. if you can explain clogged pores more.. or if you know what it is I have that would be great.. also if there is anything else you recommend .. it be great if you can write more articles on this topic because even though my acne has cleared a lot now I’m getting all these clogged pores :((.. i’ve been doing honey mask with eggs and cinnamon as well as clay mask with apple cider.. Thank you tracy you are honestly AMAZING!!!!!!!!! Your flesh colored little bumps could be anything: rosacea, seborrheic dermatitis, pityrosporum folliculitis, … or something else. However, I‘m pretty sure that clogged pores (= blackheads or whiteheads) look a little different. The cavemen regimen is working for me. But I’ve added a product called cure that deeply exfoliates but does not aggravate my severe sensitive skin. It’s not a scrub so don’t worry! It’s a gel that you put on and leave for a minute and then you rub it off and your dead skin comes off. It’s great for exfoliating if you can’t handle other things. I use it twice a week. Look it up on makeup alley it has great reviews. It really helps unclog my pores but not irritate my skin. Ladies just a quick comment. 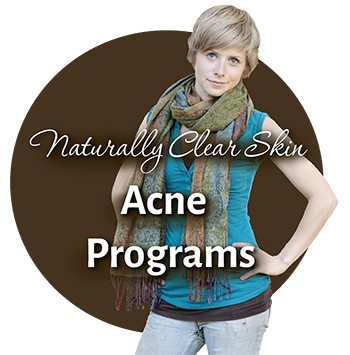 If you are looking to remove acne caused by sebum. Try using polysorbate. Either 20, 60, or 80. Use a tablespoon and massage it into your face or affected area. Do this until it has absorbed into skin as much as you can and leave for 10 min. You could leave on longer, then wash off. After you have washed it off try a solution of Msm with water (optional). Followed by the jojoba treatment as stated above. Polysorbate binds with oils and water and removes sebum almost over night. Google it. Msm is another underestimated miracle for skin. Then Jojoba as stated will moisturise your skin in a natural way and tell your own sebum glands that it does not need to produce as much sebum. Just make sure that if you use any of the above that they are all 100 pure. Most of the time we buy things online and they do not work only to find out later that the products are contaminated with fillers etc. Trust me Google do research You will see dramatic improvements and they do not cost anything. Just a recap. The reason I say this is the trick is to clear your skin below the surface before putting any kind of oil on top of any clogs from cosmetics to dirt. I know this from previous scalp and face treatments. I would repeat this every day until the desired effect has been reached. Another excellent method tried and tested is 20 gram of Bromelain mixed with Polysorbate, Microwaved on low heat until a uniform paste and proceed as mentioned above. Not only does this remove the dirt, sebum, debris below the skin it also digests dead skin cells. Bromelain is an enzyme and more active at around 50c and used as used as a meat tenderiser. When I did this it made my skin look and feel like when I was 18. You could also use a touch of ethyl alcohol for increased penetration, but when I used this I did not. Please note I am not a doctor I just going off personal experience researched through common sense and without getting tricked by worthless websites selling “snake oils” that do not work. Polysorbates are the ingredients in Mayonnaise that bind the oils to the water content. Just do a google search and you will realise that to make a years supply of this will cost no more that 30 Uk pounds and much more effective that some of these high priced cosmetics online. Bentonite Clay works amazing to unclog pores. I use it a few times a week and sometimes mix it with Apple Cider Vinegar. Thanks for the info on sebum and Jojoba – it might help me clear up the last of my skin problems! I am a man and, candidly, I think that the information I present below might help you. I have had ‘skin problems’ for most of my life – over 50 years! Dry, itchy, flaky, redness, unpleasant pustules, on and on. I was treated by various dermatologists, some very well known, and had even tried PUVA (Psoralen and UVA exposure) treatments, which were then experimental (1980’s). None of the creams, lotions, treatments were effective and I was never given an accurate diagnosis. About 10 years ago I developed innumerable painful and itchy ‘things’ that affected my upper torso, face and scalp – I went to a dermatologist with samples that I extracted – told that they were benign and not a creature, virus or bacteria to be concerned about. More creams – no benefit. But that didn’t stop me – I did a LOT of research in the past few years and thought that I had a condition called Morgellons. I tried several ‘treatments’ – NONE worked (surprise!). So, continuing my research, I tripped across one sight that had a familiar looking photo of an extraction and some related text that poo-pooed the Morgellons issue. Further research seemed to indicate that such might be brought about by . . . BAR SOAP! After some research, I immediately changed over to a less common bar soap (Castile) and a Ph balanced facial skin cleanser (since stopped, as the Castile is just fine by itself). In just a few days I noted some improvement and it now about six months later and my skin is the best it has been in the past 50 years! It’s not ‘perfect’, but greatly improved! My recent research indicates the bar soap (and my tar-based hair shampoo) share a common ingredient – tetrasodium ETDA and similar stuff (chemicals). I suspect, but can’t prove that this is the cause, but my results are unquestionable in my stopping use of the bar soaps and shampoo. I still get some of the lesions or whatever they are, but nowhere at the same level as I used to get. Yes, it has taken time for the healing – I am also hypothyroid and I heal very slowly. It is my current belief that the tetrasodium ETDA kills all the good skin bacteria and leaves the door open for my skin to become a playground for the conditions I have experienced most of my life – none of which I would want to wish on anyone. I can’t guarantee that any of this information will help you or anyone else. I can only record what has happened to me that gave me some REAL results for the first time in my adult life. I hope that the information might help you, too. I will probably post this information on other sites, such as my time permits. Good luck and I hope that YOUR condition improves. Hey Frank – thank you for your insight and sharing with us what worked for you! 🙂 For this very reason, I already definitely recommend staying away from bar soap and other chemical soaps/shampoos/hygiene products! I have a wierd congestion on my forehead with slight pimples and I was wondering if the acne and congestion would subside by not washing the forehead? Or would it jsut get worse? I am so self conscious about it and its slowly making me depressed. in my experience, not washing makes my skin worse. I’m also acne prone. I like coconut oil for cleansing, but I also use goat milk based cold process soap which really helps. I’ve tried so many oils and none work. Not even tea tree oil. I’m starting to think there’s hidden dead skin cells on my face that I’m not seeing and the oil and dead skin mix to become a clog. Could that happen? Prom is coming up and I want clog free skin!! have you ever tried to go without moisturizer, including oils? Not everybody’s skin reacts well to an oil treatment. Often it helps to let your skin breathe for a while. That’s also a main homeopathic principle: the body heals from the inside out. If you put something on top of your skin, you will most likely reverse the healing effect. Work on a healthy whole-foods diet and regular exercise instead. Don’t stress out so much about your skin. Live. Nobody cares if your skin isn’t 100% perfect. Laugh. Try to stop the perfectionism regarding your looks. Even supermodels don’t look that “well” (or simply just a little more natural) without makeup and Photoshop. It’s stressful to feel like being under pressure all the time. Yes, it takes time for your skin to adjust. Give it the time it needs. yes, dry skin can cause acne. Most of us associate acne with oily skin, so it catches us by surprise when our dry skin starts breaking out. Regular use of a moisturizer can really help your skin look and feel better and can also help combat acne. If you want to try something all natural and don’t get along with oils, you could try a plant butter like shea butter. It’s highly emollient and moisturizes your skin well. Or use a very simple cream or lotion with few ingredients only (to avoid most of the nasties). I’ve been suffering from clogged pores on my forehead for a long time. Tried almost every method eg facial to get rid of them. But it didn’t work out. The clogged pores just kept coming back. Feeling so depressed. Recently read your article and I started trying out the oil. Really hope it helps clear my forehead. Because I used to have clear skin and i missed it a lot. May I know how often do u apply the oil in a day? First of all, thanks so much for writing this blog, I think it’s great! I have been doing the oil cleansing method for about 4 months and although my complexion looked a little smoother, I was still breaking out. I was also putting Retin-A on my face at night. I just started taking estroblock and burdock root too. I decided to do the caveman regime 3 days ago and I have noticed I have gotten about 4 new painful cysts on my chin and nose area. While on the oil-cleansing method, I did get some painful hormonal cysts too. Besides the cysts, I don’t have any other acne such as whiteheads or blackheads I am also going to try and do the “no-water” method for 30 days and see how it works! Do you think its normal to have breakout within the first couple of days? Thanks. hii tracy , I did the caveman regimen for 4 months, but my face become congested with clogged pores, rred on my cheeks and chin where i used to hav acne before. i think caveman regimen cloggs pores…. m gonna try the oil from today . hope it workss.. I no longer have acne, after 3 years of constant struggle. All thanks to you and your wonderful blog! However, although my acne has gone (which it has for around 6 months now), I have a problem with clogged pores. I don’t let them bother me too much, but my forehead does look quite clogged, oily and nasty. I’ve tried doing the Caveman Regimen and I’ve also tried using Jojoba Oil as a cleanser. Sadly, neither have been successful for me. So, I was just wondering if you had any other potential suggestions to deal with these pesky clogs. Does anyone know a good jojoba oil in Canada, or better yet Ontario? I found High Altitude Organics off amazon.com but when I went to order it said none of those products could be shipped to Canada. There must be a good brand here in Ontario. Any advice would be amazing?!! Thank you!!! I’m thankful I found the Manuka Honey on amazon.ca and am looking forward to trying it out. Just went off birth control and pro-activ which I have been on both for 8+ years. My skin has gone wild, but due to this blog I have instilled a lot of hope that it will get better. First of all, you are awesome! I haven’t got entirely rid of my acne, but it’s way less. Most of all, I am more confident and not stressing so much. I am still trying to figure out what to do with my skincare routine, haven’t found the best one yet. And as everyone is so positive about the cavemen routine, I would love to try it. i am really happy to hear ur great news …!!! i am 17yrs old .i have the same problems that u had once . i dont know what i did wrong ! !when i try to minimize my pimples on my cheek i get a bigger sized pimple on the another side …i dont know what to continue with and what to stop ..its all confusing to me . as a part of my sis’s advise i went to see the doctor for this he told me to use honey and oatmeal .. now i tried that for 2 days .later seeing my face my mom is giving me good comments but still i dont know may be is this any beginning for a complete disaster???? am still very much confused … the main problem is that i always get 2-4 pimples on my face later it disappearance leaving behind marks and the pimples moves to another place on my face the same continues … and when people see me they ask me ” what happen to u ??? ur face is full of pimples ? ?” dont know what to do next for this to stop ……can u help me ???? Hi I used undiluted tea tree oil and witch hazel on my face I can’t even move my face. Buring and shribbled up, oozing clear stuff out and raw pimples. I cannot use anything on my face everythig irrates it. If I do the caveman regimen do u think it also make help this burn heal I’m am miserble and can’t quit crying. Please help me. Hi Tracy! I just found your website and I can say that it’s really helpful! I’ve never once thought that Jojoba oil can help relieve acne & this is totally new information for me. Do you think it can help reduce pore size as well? And… are you feeling comfortable with your cavemen routine? Personally I’m feeling a bit uncomfortable if I don’t wash my face everyday.. Although the caveman sounds wonderful, I don’t think I am brave enough to do it. I am in the middle of my journey to clear skin. It has been a long journey but I am seeing results, slow and steady 🙂 Diet is huge. Thanks for all of your good suggestions and advice. I agree that we are all different and I am still trying to discover all of my triggers. What a battle but I have prayed so much and am currently trying a few things and am getting some positive results. I can’t wait to see what happens a few weeks down the road. As far as facial cleansing I steam it in the evening and use a gentle all natural facial scrub mainly to get the make-up off. I only use a tinted sunscreen/moisturizer as this helps me get through my day a little more confidently. I then use pure vitamin E oil with a tiny drop of Tea Tree oil and spread a thin layer all over my face. My face feels calm and relaxed at bedtime. In the morning I steam and gently wipe followed my a cool rinse. This seems to wake up my skin. I then apply my BB cream for sunscreen and cover a few blemishes. I would love to be confident enough to walk around all natural but I am not there yet. Any suggestions for me? Hi I stumbled across this blog and really wanted to comment with my experience. I’m a hippie at heart, and after years of abusing my body, I’ve finally come to realize that less can be more. I’ve had horrible horrible skin. I’m now 37. It took me this long, with this many years of bad skin, to learn that the best thing I could have done is NOTHING. I stopped washing. On occasion I will use Manuka honey to clean my face. And I experienced the same thing another reader commented on, my face started flaking. And to help with that I use Vinegar as a toner on occasion. I think the flaking comes from the skin trying to rebuild the protective layers we’ve been conditioned to strip away. I’m telling you…almost four weeks later. My crater sized pores are almost gone, black heads too. I stopped wearing foundation. I have scars I cannot reverse, but hopefully with time and being good to my skin, those too will fade with time. Acne sufferers need to know the truth. The truth is, our bodies need to take care of itself. That might mean holding yourself accountable too. Such as eating better and drink more water. God bless. I recently started taking Estroblock to help my hormonal acne. Only one pill a day to start slow, for about a month. My face definitely started to clear up, which I’m psyched about… but I noticed my skin was oilier. Then, my entire chest blossomed into pityrosporum folliculitis. I stopped the Estroblock immediately and am now treating my chest with Nizoral shampoo topically, and also anti-fungal cream. I’m in a wedding in a week, though – so I’m kind of panicking. Any advice?? I am a 19 year old male and have recently been very concerned about clogged pores on the front of my nose. A year ago I was worried about clogged pores on the sides of my nose and went through a bunch of cleansers to try and fix it. This didn’t help and now I have clogged pores on the tip of my nose, why did I ever mess with it? Right now I am trying the caveman regime and have been at it for 10 days. I notice the congestion in the pores has gotten a little worse due to the dead skin covering the pores. Mind you, these aren’t small either because my face produces a lot of oil. I was wondering if you would recommend I use a Manuka honey mask once a week just to help clear it up a little? My main concern is that by completely leaving the pores alone, they will become enlarged in the process of becoming better. Advice would be very much appreciated for I am pretty depressed over the issue. I have the same issue. I know I’m not Tracy but I hate to see other people depressed with their clogged pores like me. so my nose is also clogged and I haven’t touched it at all except for washing it every night for about six months. And honestly–nothing has changed. They are still in the nasty same state as they were six months ago. I’m thinking jojoba oil might help with this. Tracy would recommend that both of us use jojoba oil on other parts of our face? Or is it only for foreheads? so i wanted to know that should i go for it being a teen of 15 !! and my acne area s mostly cheek ! There are variety of jojoba oils available in market. Will you please suggest which brand or type of jojoba of oil to use? I used to use jojoba oil and lived it but I’m afraid of oils now as argan oil left me with a pretty congested chin. Since then (~6 months ago) I’ve been unintentionally doing the caveman regime because I’m afraid to put anything on my skin. My skin was pretty perfect before this which is annoying but oh well! It’s hard to get advice from Internet articles because they all seem to assume your skin can’t fix itself unless you pile on all these terrible products so I’m glad I’ve found your site. Do you think the bumps can go away on their own or will they just stay forever? Or does the caveman regime just take ages to see big changes? I do think the congestion has improved a good bit over the 5 months. Would it be ok to use jojoba oil on every part of my face if I buy some? What do you do when your skin starts purging? Do I keep applying it and make sure NOT to pick? Hi Tracy, I was wondering which jojoba oil you’re recommending right now. I tried to order the one you originally posted and it seems to be unavailable. Just curious which one you’re using? I’ve had acne issues for years. I’m 46 and I’ve had enough! I’m ready to try some of the things you’re recommending!